I’m glad that you survived the shower, but I wish that your sister would have been there for you a little more than she was. I hope that she at least recognizes how hard it was for you to even show up…. I’m so glad you made it through the shower even though it was harder than you anticipated. You did the right sisterly thing even if your sister didn’t return the favor. I’m so proud of you! I’m glad you survived! I can only imagine how hard it is to navigate a new relationship with a sibling when she has the very thing you want most. I am going to a bachelorette party soon and from the facebook posts about it I feel that there may be some pregnant women/people with newborns there and I’m scared that I will burst out crying if talk starts to revolve around babies. Even though I’m not religious at all, the part about the rainbow was touching and I find myself believing it is a sign of good things to come for you. Aw, that’s so nice to hear. Thank you! And hang in there with the bachelorette party. It’s hard to have to sit through talk like that, but hopefully they’ll be more focused on the bride and weddings and all of that. Good look! I think I am just scared because 2 very pregnant women came to the last bachelorette I was at and complained about their discomfort and told the bride not to do it (in a joking way, but it really bothered me). And I saw some comments on this party’s facebook event page about people not being able to stay the night (it’s just outside of town) because of the baby, etc. 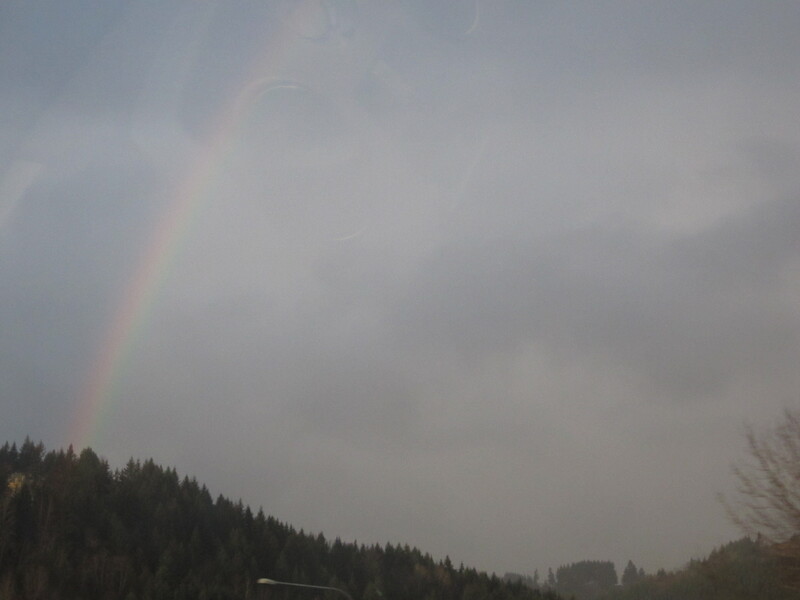 BTW I saw a patch of a rainbow peaking through the grayish sky on my drive home and was moved to hopeful tears. Aw, that’s so nice! And just know I’ll be thinking of ya while at the party. Thanks. From reading comments on the facebook page today, one of the guests is definitely pregnant . . . . give me strength not to cry or turn green with envy! Glad I’m not alone at least! your posts are never too long! i look forward to reading all of them, keeping up with how things are going with you. i hope and pray everything turns around for you soon! Hey girl. I think you were SO strong to go to that shower. Also, about your sis not emailing back, I’d feel the same way. I am very much a give-and-receive type of person–if I put it out there, I expect a response and that’s hard. It’s hard to try and see the other side, which is that she took it as a nice gesture that she had no need to return because it was just that. I think you’re doing beautifully. I hope that AF shows her ugly face, for your sanity! You, my dear, are a good and sweet true friend and sister. If only we could say the same about all parties involved here. It’s wonderful that you saw the rainbow after that experience – a lovely little reminder of Teddy Graham. Stay strong – and hey, Cassie’s period, give up!! Yay! At least the shower is over and you did your best to be there for your sister. I know all to well that lump in the throat feeling! Sweet lady, I’m glad you survived the shower though I wish it had been better for you. As hard as it may be sometimes you just have to leave the lines of communication open and hope that one day your sister will realize what a wonderful friend she can have in you. Don’t give up. I love the rainbow. It’s evident that someone is watching out for you when you need a boost to the spirit. Still hoping that your extremely stubborn period shows up soon. You made it through. I’m sorry your sister wasn’t there for you like you were for her, but I’m proud of you for continuing to reach out to her. I hope one day she returns some of the love and kindness you’ve openly given her.